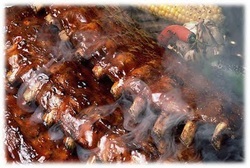 Baby back ribs get their name because they come from hogs rather than the larger sows. Baby back ribs between the back spine and the spare ribs. Baby back ribs are a little more tender rib meat which increases the price per pound. Though these rib racks are smaller in rib length, they are typically more meatier than spare ribs. This almost makes up for the size difference, but spare ribs do serve more meat per slab. Try this baby back rib recipe for a delicious smoked flavor that will melt in your mouth. Before you season your baby backs, flip them to the bottom and slide a butter knife under the white fatty membrane that sticks to the ribs. Removing this will allow the smoke to better penetrate the meat for a tasty rack of ribs. Add all of the seasoning rub ingredients together and rub it on the top side of the baby back ribs. You don't need to worry about seasoning the bottom side where you removed the white fatty membrane. Once your smoker is heated to about 225-235 degrees Fahrenheit you are ready to put your wood chips directly on the charcoal or in a smoker box. Place your pork ribs on the smoker with the membrane side down and the seasoned side up. This will allow the fat in the baby back ribs to melt downward while it smokes and baste the meat. Your ribs will take anywhere from 4-6 hours to smoke depending on the temperature of your smoker and other factors like how open your vents are, the temperature outside, and how often you open the door to check on them. Some people enjoy dry ribs, so this step is optional if you want to caramelize barbecue sauce directly on the baby back ribs before you serve them. To caramelize the BBQ sauce, mop on the sauce directly on the finished rib and slap it on a hot grill. You want to heat the sauce over a hot grill to cook it quickly to form a caramelized crust. After you remove the ribs from the grill, wrap each rib in aluminum foil and let them rest for a 15 minutes before you cut into them. This added time will improve the tenderness of the ribs. It will also prevent them from turning into mush when you cut into the ribs.